Nothing surprising here. The Catholic Church never had a foundation in the teachings of Yeshua from day one. If you want "Catholic salvation", just do what the Pope says. If you want the true salvation, read what the Bible says. Yeshua clearly stated that all unbelievers will be destroyed at the resurrection. The idea or concept of salvation for everyone, regardless what they believe or do, is foreign to the Bible. But hey, go ahead. Believe whatever makes you happy. I suppose that would be true if the bible were anything more than legends and stories passed around by ancient man (a fact.) Since I believe there is no heaven, and there is no god, (neither of which I know for sure, and cannot be proved one way or another by man) I'm not particularly concerned. I live a good life and that's it. If there is a god, and he punishes me for using my logic and intellect to rightfully conclude he didn't exist, then I'd rather be out of his graces since that seems very un-godlike of him to me. If you don't believe in God, why worry about whether there is heaven or not and whether you will be allowed in? it wouldn't be an issue at all if the jeebus freaks would just shut up and quit trying to push their agendas into my public schools and civil legislatures. Keep it in your monuments to mythology.. I mean churches, and your homes, and everything would be copacetic. I don't worry about idiotic religious crap. I despise any pedo-priest or any pedo who smirks and says he forgives people. When a criminal smirks and says he forgives you, it is long past time to arrest him and execute him. He should not be free. Thank you Francis for being a peace maker. It is apparent as I read these blogs that so many non-believers are believers. You rant as you have the right to do, yet refer to God and heaven as if they exist, which they do. You guys are so close to actually becoming believers in the greatest sense, you just don't know it yet. You are a bunch of Paul's roaming the earth almost there, and you will all be the zealots for Christ out of love for your brother. Your time is coming. Meant in the most respectful manner, have you read Thomas Paine's "The Age of Reason," or, is your faith not strong enough to withstand a simple test? Truly, no disrespect intended in my challenge. We also talk about Voldemort being evil. Doesn't mean we believe he exists. PS: "your time is coming" is very spiteful and unbefitting of a soldier of God. M-Being a former atheist, I have read many accounts on both sides, and went to Jerusalem, sought people to speak with on both sides of the aisle. My life was changed as my belief in God and Jesus grew. So, Mark, I will take that to mean that you will not take up my challenge, at least right now. That's ok, but it will always be there. Mike "your time" was referring to your time as a believer. That is a good thing, by the way it is all personal. I have in the past on this blog referred to an exceptionally rude atheist as his time being short. That's my human shortcoming. But Jesus stills love that atheist while there is still time. No, but being a former Catholic, I read "the" book, the only one which counts in the minds of most Christians. And then I read "The Age of Reason," and then coupled with my human experiences, it all made sense. It would be nice to know that there is a greater being than myself, one not as portrayed by the bible or religious folks, but I have no evidence of such a being. However, just as with science I tend to believe what has been shown, I also keep my mind open in case something else should be shown. But all proof to date, or the lack of it, says otherwise. The interesting thing is that The Age of Reason is completely compelling without science. M-I understand your questions about faith being raised catholic. My wife was a former catholic, but now a "Christian":} The"church" has done very evil things over the course of history out of selfish ambition, which biblically is wrong. My relationship is personal and not based on any church doctrine or church leaders edicts. I trust fully that if you give God a chance in your quiet moments away from the white noise you will be pleasantly surprised. Too many fragments I couldn't follow. Truth is...I don't have much use for the Pope "office" either, I have a direct route to God, that would be Jesus Christ. The Pope is simply a brother in Christ. And I love him as such. That does appear to be the appeal of the newly evolved Christianity – that you can have a personal relationship with God and don't need a go-between. It's definitely an improvement over who can provide the best offerings/sacrifices, like in the old days, because poor people could not afford to make such great sacrifices/offerings. Truly, this is more affordable – I see why it's harder to turn down. But, Thomas Paine's "The Age of Reason" is more compelling, and will free your mind so that you can be a better person, or at least start on that journey. Hogwash! Pure and simple. Atheists could care less on whether or not they would be admitted Into this non-existent realm. My faith in Jesus Christ is the hope I got. You seek out in the world. Where is he? Not the Vatican or churches, temples or mosques. Look inside and you will find the Real Christed One. That is a level of consciousness available to all who seek. Even Buddhists, Hindus and ...muslims (the really peaceful ones). I think it would be more accurate to say that nobody goes to heaven (or hell for that matter). Religion is a social construct, nothing else. Gods are ideas–concepts that are perfected over time for various reasons. maybe ....but you and I both know you will be second guessing yourself on your death bed. @Jimmer Nah most of us will be demented and unable to recognize our own kids, or realize we're even in a hospital let alone contemplate the existence of god, just saying. Turner – Ha! Very true, very true! .... Perfected over time.....?? If today's religions to be are considered "perfect", boy, I sure am glad I did not live when they were being perfected! The wretched nature of religious dogma is one of the KEY factors that is causing the agony of protracted wars, yes, even today. Even WWI and WWII had nothing to with religion per-se. 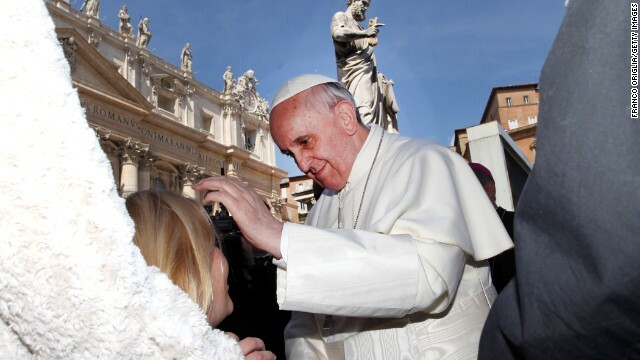 That said, Pope Francis' words are truly encouraging – especially for agnostics such as myself – not from the 'hope' of 'me too can go to heaven' but the overdue acknowledgement that the catholic church is opening itself more to 'common sense and reality. Think about this, if a recognized/well accepted Muslim leader (yes, it does not sound too realistic) says something similar, it would certainly bode well for humanity overall. Assuming of course the recognized/well accepted Muslim leader would not be killed the next day for being a blasphemer. From where do YOU resonate? That is where you are going. Can't create it, you can simply BE. Give it a name or keep it nameless, it does not matter. From an Atheist to the Pope I say well played sir good game. The pope is a devil for saying something so stupid. No wonder I left the Roman Catholic Church. Yep, every time someone says something you don't like, they're the devil. Yarah Yeah the old pope kicked the angels with pitch forks off team last xmas so no horn-y red devil either ! Fish From Hell! The Worlds Strangest and Bizarre Sea Creatures! (EA) FÓSILES, FOSILIZACIÓN Y PALEONTOLOGÍA. If you miss the cross of Christ, you miss everything. No, not true – we (and you) are capable of incredible kindness – it's part of our human nature. I practice spontaneoius acts of random kindness on a daily basis. I live by the strictest code of honor possible. I live a life closer to what Christians aspire to without being a Chrsitian. The one node or the other lies within the breast of the individual, not who they associate with or say they believe in. Absolutely! No Christ, no heaven. I do not deny that atheists or other non-believers are capable of kindness and goodness. It just wont get you anywhere with God. All your goodness and kindness, while may be of value to your neighbor, is only a clanging cymbal to God. Considering that the Catholic Church INVENTED the Bible and even JESUS! The Universe does not know that the Pope even exists. The real Being they later named Jesus after doesn't care for the Pope. My big smelly toe has more holiness than the Pope. The Pope said this because to believe otherwise would mean that God is a self-absorbed monster who cares only to be worshiped, rather than about acts of kindness. Unfortunately, these comments show that many of us still use our belief in God as a tool to attack others, as a wedge to seperate us from groups we dislike, as an excuse to cut off all reasoned debate and devalue the views of others. Great truck................pulled some real big stony irons out of the ground with mine. Also can pull the shuttle. Was spiritual and believed in Higher Being. Now with some difficult situations in life I ask....Where is the Higher Being? A little glimmer of hope....NONE. I think positive thoughts from within yourself are your Higher Being. Working, living and going about daily life is your Higher Being. Our mortality commands the higher being within us and nurturing family, friendships and people in general. Heaven is life. What happens after is wasted in theories not needed. Just an observance. Very well and respectfully put – thanks for sharing. Do not believe this lie. Scripture is specific that the only way the Father is through the door, which is Jesus Christ. The Word of God is specific that our good deeds are like filthy rags(historical reference point to menstruel rags) to God. It will not matter how little old ladies you hold the door open for, or,walk arcroos the street, how many lives you save from physical death, or anything else. Good works alone will not get you to the Father. If you truly believe that Christ died for your sins and was Resurrected, you accept His sacrifice for your salvation and repent from the things that seperated you from God(sin), you will be saved from damnation. That's His promise. And yes, you can do this now or be like the thief on the cross and accept Jesus on your deathbed. He could only ask to be remembered by Jesus, and could not do any 'good works' to help get himself to Heaven. The biggest problem is that you, or anyone else, wont know when we will die and may never get to have the chance to do this. His gift is totally free. It's up to each one of us to accept Him. No, I must say that human beings are not vile creatures, as your post implies. Put down your Book, and open a book on reason, and you can learn about kindness through our basic nature. There are 2 billion Christians on this planet, There are FIVE billion who aren't. So you're saying that your "god" who supposedly created us all is willing to send 5 billion to an eternal place of fire torture pain tears gnashing of teeth and water-skiing on a lake of fire (but he loves us!!) Your god is a sadist of the highest caliber. It is hilarious when a follower calls his highest, most respected god representative a liar. Problem inside the church ? faith crumbling ? Dispute with your own priest ? the pope is trying to repair the hateful image of the church, of threatening hell to non-believers, it's ancient, hateful, revengeful, not worthy of a being supposed to be benevolent. And here is a follower still held up with old practice. The truth is already known by atheists, they don't care since it's a fantasy anyway, but your disagreement with your own church shows signs of crack of your own belief. Maybe you are the one who will be banned from heaven for disagreeing with god rep ? No he loves you Mirosal as much as he loves me, however, it is not a free pass. You actually have to believe in him, and his ultimate sacrifice. As all powerful he had no obligation to save you, but he chose to through his son. That is the biggest lie in this World Dude. You based it on the Bible and that was invented by the Romans. The Catholic Church is an abomination. The Jesus you read in the Bible is not even a real person but a construct of several Myths put together at the Council of Niscea in the 3rd century. Open your eyes and see the lies. Mark... what if I choose to completely throw away Christianity (I already have though) and decide to embrace Judaism or Islam .. am I still going to hell? It's the exact SAME god after all. What then? Are all Jews and Muslims going to hell simply because they don't pray to your jeebus zombie? Mirosal..not my call. I know what I know about my salvation. Not my place to judge. Now he is starting to sound like the car dealership down the road "Jack say's YES to every deal"
No, because your motivation to be atheist would be wrong. We don't just get to pick what to believe or not believe. I didn't know that the Pope decided who gets into heaven. He doesn't, but we can each decide that we simply need to be kind to each other just because it's the humane thing to do, and not because there's a perceived reward (which I don't believe). Who does, then? The men who wrote a ludicrous storybook called The Bible thousands of years ago? The charlatans who perpetuated its fiction as fact for all the years in between? The indoctrinated masses who believe it? The Pope gets to decide just as much as anybody else does, seeing as it's an attempt to answer a question that doesn't actually exist. He'd do just as well to announce that atheists can now visit Narnia. The Pope is spewing lies, and taking the world to hell with him! Salvation comes ONLY in obedience to Jesus Christ. There is no other name by which men must be saved. If the Pope preaches a different gospel, then he is anti-Christ! Period. OR, or, and I know this is hard for you to believe,but the pope might know juuust a little more about Christianity than you. The Pope may know what it may mean to be more Christian, for that is his business, but he may not know what it may mean to be more humane, which should be everyone's business. Whatever you hold true on earth, so too shall I hold true in heaven. Or something like that. Although Knowing Christ is supposed to be his business, No, the Pope doesn't know Scripture. If he did, he would know what he said is a lie. The pope is playing in a popularity contest, and trying to make people feel good about their separation from God. Our salvation in not contingent on degree of the relationships we have with other, but on the relationship we have with God. Those choosing not to have a relationship with God in this life will not be condemned to live through eternity in His kingdom with Him after their life here. Juanito: Your apparent salvation is apparently contingent on faith (properly defined as belief without evidence). Do you happen to care that what you believe is substantiated by evidence or do you accept every story you read a fact without looking for evidence to support it (especially one like the buybull)? Didn't do a thing for the folks in OK.
Actually, atheism is healthy because it allows us to realistically view an issue and hopefully provide a reasoned response. Nope, I wouldn't wash your dishes or serve you. IF heaven exists, maybe your imaginary friend is choosing us over you due to the fact that we were smart enough to question its existence instead of simply being gullible by reading 1- 2000 year old book. Mark: Come back?? Not to your god and certainly not in the manner that christians present it. Truth we have a history and I feel his love for you. What history? The bible?? The bible has been debunked over and over again...no global flood. no resurrection, no virgin birth-none of those things can be proven with substantiating evidence. It is you who deserves pity for not living the only life you are guaranteed of to its fullest. Truth by history I meant you and me. The Catholic religious structure teaches that it is above God and that God is required to follow its decrees. That is not what the Bible teaches and the current pope's statements that heaven can be achieved through good works regardless of beliefs is not what the Bible says either. According to the Bible, God says that He is jealous of and does not share his power. Further, the only way to heaven is to believe on the Son and accept Christ's righteousness. Good works is the result of thankfulness to God, not a price/cost to enter heaven. God is jealous? Is jealousy really an attribute of a being that can crush everything else out of existence? That makes absolutely no sense. of course "god" is jealous ... read the first commandment. Pure jealousy there. "He" is quite the selfish deity. "He" is as childish and has his tantrums just like the Greek and Roman "gods". Good works are the result of religious thoughts? I respectully and wholeheartedly disagree. I refused the chakles of religion when I was but a tyke of four (well over half a century ago) and priactice random acts of kindness on a daily basis. Flod victims, tornado victims, anyone needing a spot of help will get it from me. My life has been honorable – I don't lie, steal or cheat; I'm blind to a person's color, gender or country of origin ... and I make an honest effort to be as non-judgemental as possible. Compare that against what I see coming from those that profess to be devout Christians (and other major religions) and I will take my life over theirs any day of the week. The hate, bigotry, et al, that I hear some preachers spew would embarrass your lord and saviour, should he ever reappear.